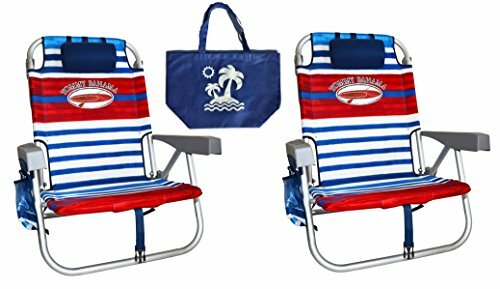 This is a bundle of 2 Red White Blue Striped Tommy Bahama Backpack Beach Chairs + 1 medium Tote Bag. **The tote bag is NOT a Tommy Bahama article** FAQ: -How high is the seat from the ground? The seat is 9 inches from the ground. -What are the dimensions of the tote bag? The tote bag's dimensions are 20 x 13 x 8 inches. If you have any questions about this product by Tommy Bahama Beach Gear, contact us by completing and submitting the form below. If you are looking for a specif part number, please include it with your message.